Exclusive charter is pleased to announce the addition of the Super Yacht KOKOMO. Now available for charter in the Caribbean, Turkey and Croatia. KOKOMO is the third superyacht from Alloy Yachts for the same owner. The brief was for a yacht that would break new ground in performance, comfort and style. Designed by Dubois Naval Architects, this 58m sloop delivers in all respects. Her sleek hull has been refined for seakeeping and speed. 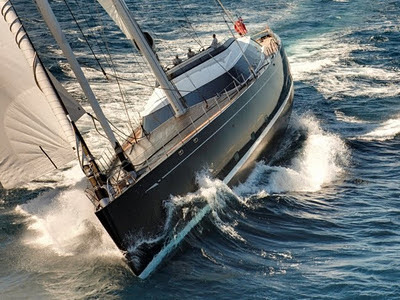 Her 120 tonne keel lowers from less than 5m to over 8 m to deliver ultimate stability under an enormous sail plan. Kokomo is a yacht that will storm across oceans, turn heads in any anchorage and cocoon owners and guests in a welcoming and supremely elegant environment.